Jerry Mitchell, investigative reporter for the Jackson Clarion-Ledger; Kate Royals, education reporter for Mississippi Today; Bill Rose, senior Overby Fellow for the University of Mississippi’s Overby Center for Southern Journalism; Ronnie Agnew, executive director of Mississippi Public Broadcasting; and Marshall Ramsey, editorial cartoonist for the Clarion-Ledger, discuss covering news during a time of heightened distrust toward the news media. 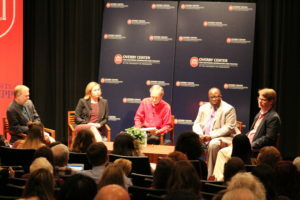 Four prolific Mississippi-based journalists discussed continuing their professions in a largely Republican state at a time of increased hostility toward the press at a 2017 SEJC panel held in the University of Mississippi’s Overby Center for Southern Journalism Feb. 17. Titled “Assault on the Media,” the panel featured Jerry Mitchell, an investigative reporter with the Jackson Clarion-Ledger; Marshall Ramsey, an editorial cartoonist for the Clarion-Ledger and radio host; Kate Royals, an education reporter for Mississippi Today; and Ronnie Agnew, executive director of Mississippi Public Broadcasting discussed the current state of distrust towards the news media on both a local and national scale. Bill Rose, senior Overby Fellow for the center, first asked panelists about President Donald Trump’s 77-minute press conference that occurred two days prior, during which the commander-in-chief claimed the media are no longer trustworthy. Agnew, erstwhile executive editor of the Clarion-Ledger and four-time Pulitzer Prize judge, said with every tweet, Trump weakens his own power. “I think it plays well in some parts of the country, but I believe that when you cry wolf as many times as the president has with the media in 6 a.m. tweets, people with brains can start to decipher for themselves what is news and what is not,” he said. Ramsey, an editorial columnist whose work has appeared in the New York Times, Clarion-Ledger and USA Today, said members of the media must also face “trolls,” or people who make contentious statements for shock value, who have been “emboldened” by the polarizing national discourse. Mitchell said regardless of what subject matter reporters cover, journalists must exercise caution, especially in a time when objective journalism may fall prey to U.S. public opinion, which he said is “splintering” in wake of polarizing news media outlets such as Fox News and MSNBC. Agnew said the press should consider what it misses when reporting; he noted that the press missed covering Trump when it missed speaking to community members. 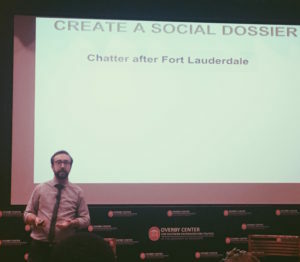 Ramsey, meanwhile, said journalists should take note of who they follow on social media, as well as avoid creating an “echo chamber” of concurring opinions on their feeds. 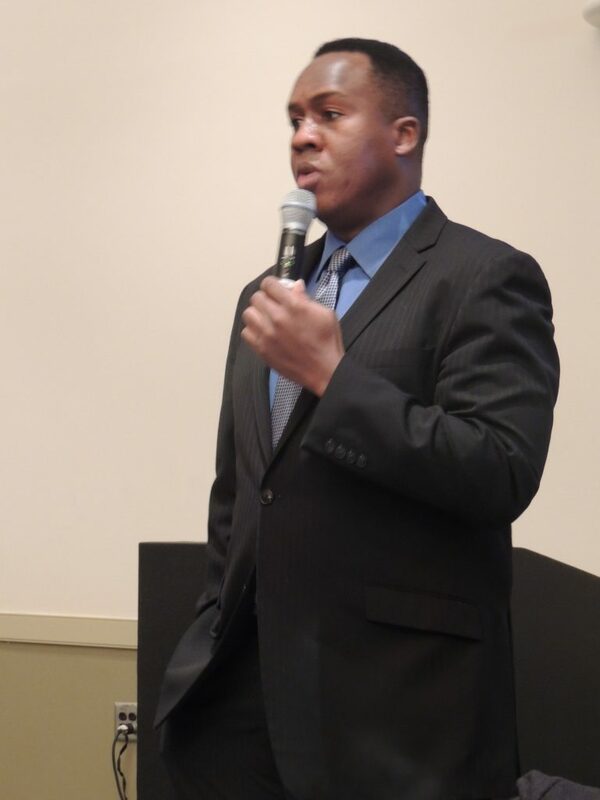 The panelists also discussed covering Mississippi, which Mitchell said has poor records laws. 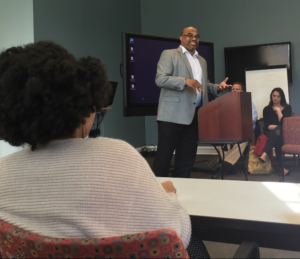 Mitchell, a Pulitzer Prize-nominated investigative reporter with the Clarion-Ledger whose work has prompted four Ku Klux Klansmen’s convictions, said developing sources is crucial to community reporting. Brian Blakely, a senior mathematics student from Louisiana Tech University and photographer for the university’s newspaper, said although he is not a journalism major, the panel spoke to what he sees his coworkers experience. “It’s still interesting to see and hear the stories of people and the trouble’s they’ve had then and how things have changed over time,” he said. 2016 Convention, Austin Peay State University, Clarksville, Tenn. The 30th Southeast Journalism Conference convention teemed with alacrity as student journalists and their advisers brushed up on the latest news trends, tricks and technology. 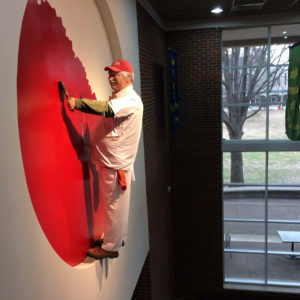 Held at Austin Peay State University in Clarksville, Tennessee, the three-day-long conference Feb. 18-20, 2016, hosted around 350 people from 37 universities in six states. Conference-goers meandered around the Student Union halls like children around a candy display. The university’s hilly landscape transformed into a refuge for college reporters from which they could gather anything from insight to sheer motivation. “It was just an incredible experience seeing all these people that are passionate about the same thing as I am,” said Claudia Young, 20, from Arkansas Tech University. The APSU newspaper, The All State, celebrated its 85th anniversary of publication with a “birthday party on” Thursday, Feb. 18. A panoply of old newspapers decorated the room, and party-goers decorated the air with questions and comments about the papers’ designs. The smell of old newspapers accentuated the rummaging through the venerable parchments. The night of news nostalgia also commenced the conference’s onsite competitions, which tested journalists on subjects such as news writing, law and ethics and anchoring. During the birthday party, feature writing contestants threw questions to The All State’s editorial staff like a major league pitcher. “I got to talk to a lot of students and get interviewed about my career at The All State,” said Katelyn Clark, SEJC student president and The All State editor-in-chief. While feature writers queried the paper’s loquacious staff, the arts and entertainment contestants covered a comedy show hosted by the Upright Citizens Brigade. The next day’s competitions had news writing contestants cover a staged protest regarding APSU’s missing mascot, Governor Peay X.
Peay X, the original mascot, was replaced with The Governor. Despite students’ voting for the original mascot, Peay X has still eluded APSU. “It was a lot of fun because we have been documenting the missing mascot stuff, so this was a good way to kind of get the ball rolling on that,” Clark explained. When students weren’t flaunting their finesse, they were in professional development panels. Reporters and professors offered a peek into their experiences, which ranged from digital storytelling methods to the relevance of World War II to today’s news. One session that stuck out to Young was “Digital Chameleon: Shape-Shifting in the Ever-Changing Media Landscape.” Young, who said she enjoys editorial and op-ed writing, found solace in the panel. According to Clark, preparation for SEJC began after last year’s convention in Atlanta. “Once we realized that we were gonna be the host school for the following year, when I got elected SEJC student president … we pretty much started planning right then,” said Clark. The process provided Clark with an experience she said will help her in the real world. 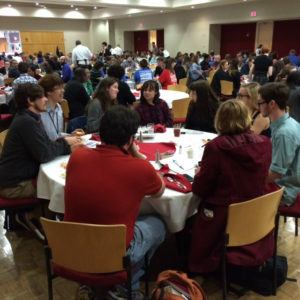 The onsite awards luncheon was held in the Student Union at Austin Peay State University on Feb. 20. 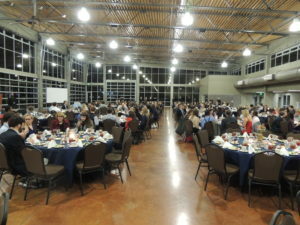 The event culminated with the Best of the South Awards Banquet on Friday, where students were garlanded for feats accomplished in 2015, and the onsite awards luncheon on Saturday. An antsy ambiance filled the rooms as nominees and applicants awaited results. With the conference location’s shift from bustling Atlanta in 2015 to bucolic Clarksville, the SEJC shifted to a more spacious venue. 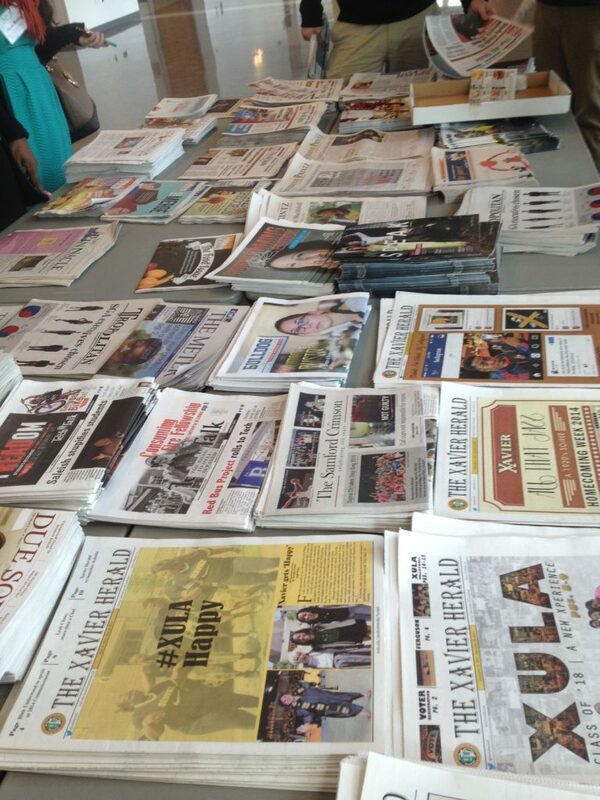 Despite the conference’s ample space, the shared passion of journalism students made the event intimate. Clark related to the energizing conference feel; in her third year as part of The All State and SEJC, she recalled her conference experiences. The schematics behind hosting a reporters’ retreat, however, demanded an even more attentive eye as Clark transitioned from attendee to administrator. In an age where everyone can be a journalist, Gene Policinski, a founding editor of USA Today and chief operating officer of the Newseum Institute and its First Amendment Center, predicted that use new technologies will make reporters’ credibility a more valuable commodity. 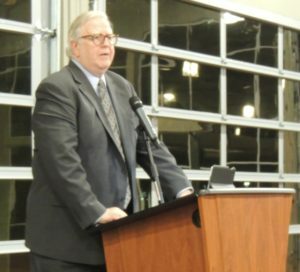 Policinski was the keynote speaker for the Best of the South Awards Banquet, held in the Wilma Rudolph Event Center during SEJC’s 30th annual convention in Clarksville, Tennessee, on Friday, Feb. 19. He called the modern cell phone both a toy and a necessity in today’s media world. “You and I, I suspect, see our lives through this prism, through this device,” Policinski said, holding his cell phone. “And that, to me, is where we’re going to have to be in the 21st century, despite all of the talk about the future of the free press — the viability of journalism in a world where everybody is a journalist. And when everybody is a journalist, whom do I trust? “But when you move across that spectrum of a toy to a tool to a necessity, the value of the information that I receive goes up exponentially in terms of, is it reliable and is it credible?” said Policinski. However, he added optimistically, consumers will still turn to good journalism because they will still ask themselves where can they find the information they trust and where can they find the people who really know what’s happening. Even with op-ed columns, he said, he has found people look for opinions that challenge them. He stressed the importance of quality journalism, and the positive impact a story can have on thousands of lives, citing a story about two local journalists who recognized a regional trend in infant deaths in hospitals. He also stressed the importance of the media to be able to get interviews, get information and provide discussion for the masses. “We’re all participants in this incredible moment in human history where, for the first time, we can talk to the rest of the planet and it can talk back,” he said. Policinski is a co-author of the weekly, national column, “Inside the First Amendment,” and is host of the online news program “Journalism/Works.” He is an adjunct faculty member at Winthrop University in Rock Hill, South Carolina, as well as a certified journalism educator from Journalism Education Association. 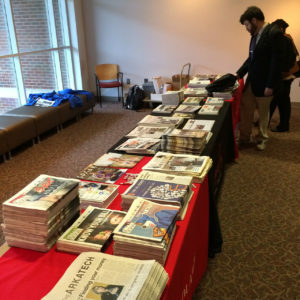 Kevin Slimp, founder and director of the University of Tennessee Institute of Newspaper Technology, addressed the continuing importance of newspaper columns during the 2016 SEJC conference on the Austin Peay State University campus. Although newspapers are traditionally known for relaying news, they also feature columnists’ opinions on a multitude of potentially controversial subjects. Even though columns may not be considered news, Slimp said good columns can be highly regarded because of what goes into them. Even though columns are based off opinions, Slimp said the important part is backing up opinions with research and talking to experts on a particular subject. He also said the best columns are the ones that bring light to issues in society. However, Slimp said these controversial topics often scare young columnists away. After choosing a topic, Slimp said the writing process is different from newswriting. While it is important to make sure your grammar is correct, he said you have to be more casual when writing a column. He said the best advice he ever received was from his high school senior English teacher. “You write the way you think and people will read it,” he said. Writing the way you think includes putting more of your personality in it than you would with news writing. He talked about a column he wrote three years ago regarding large newspapers that elected to go “digital only,” including The Times-Picayune in New Orleans. So Slimp wrote a column about the importance of newspapers. He said a small group in New Orleans composed of eight individuals who owned about 75 percent of the city’s wealth contacted him about New Orleans losing its primary newspaper with the Times’Picayune going to three-days a week for its print edition and focusing on its nola.com website. 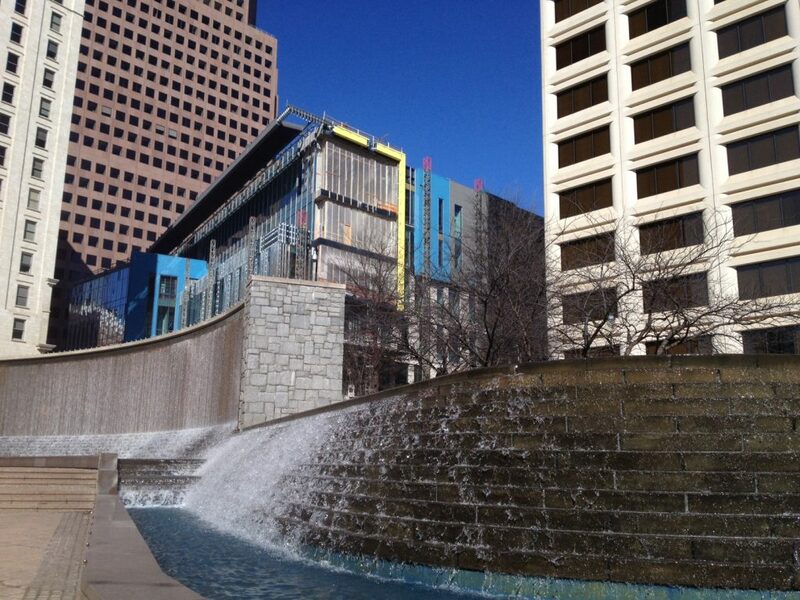 The group was concerned that the loss of a daily newspaper would drastically affect the city’s economy. “They were concerned that if New Orleans loses its daily newspaper, then everyone will consider us a second-rate city and nobody will want to move their industries here and it will be a huge economic blow to the city,” Slimp said. Ultimately, rather than the city losing a newspaper, he said The Times-Picayune just lost its quality. In turn, The Advocate of Baton Rouge swooped in and became New Orleans’ only daily newspaper. Slimp said this was proof that newspapers will never die, but also partially because newspapers are the most accurate medium for news. “Really, if you really want to find the truth today about news, you really need to look at a newspaper,m because newspapers check sources and double-up on sources and check facts,” he said. “When you watch TV, like ‘60 minutes,’ they can stick a microphone in front of anybody, and anybody can say anything. Austin Peay’s Rob Baron, Ph.D., a communication professor, focused on the ever-changing state of modern journalism, particularly focusing on social media’s role in that evolution. This quote was the thrust for the entire panel: Because journalists and their readers use social media, journalism must adapt the way they write, then market the news to how the consumer wants to receive it. Just as journalists in the past had to adapt their styles to radio or television, Baron said, today’s journalists must adapt to the new frontier called the Internet and the new technology called social media. Citing data, Baron said that in 2013, 47 percent of Facebook and Twitter users used the social media sites to access their news; by 2015, the percentage jumped to 63 percent. He added that 23 percent of Twitter users and 28 percent of Facebook users discuss the news on these platforms as well, and the need to adapt becomes apparent. Some of the key points Baron outlined for becoming successful at using social media to promote journalism were that the “spreadability,” or availability, when the audience needs the information, must be considered along with portability, reusability and its relevance to multiple audiences. Also, the information must be a part of a steady stream of material to keep your audience engaged. However, Baron pointed to the work of Henry Jenkins, Ph.D., Sam Ford and Joshua Greene, Ph.D., from their book, “Spreadable Media: Creating Value and Meaning in a Networked Culture,” as having a potential answer. In their book, they hypothesize that a piece of medias’ viral nature may come from engaging in a shared fantasy, using parody and humor, activating “cultural production” in audiences, offering an air of mystery, engaging rumors that speak fears or desires and activating civil engagement. However, Baron said, the most important thing journalists can do is to build themselves as a “brand” they can sell online. “I think building a social media brand means finding a voice, being able to find out who you are in terms of a coherent identity,” Baron said, “finding like-minded allies that can help you spread your message and inhabiting social media communities. “It doesn’t mean you’re out of control and you don’t have a role to play in it, but, like white-water rapids, social media is going to go the way it wants to go,” Baron stressed. 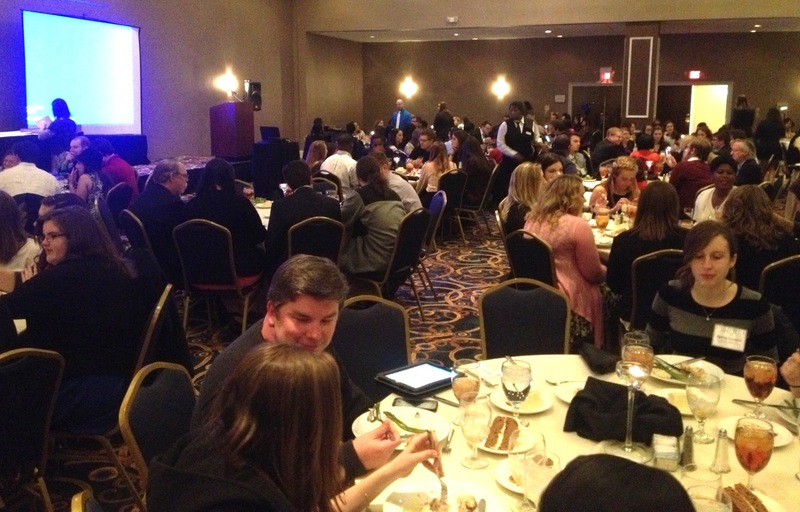 About 300 people attended the Best of the South Awards Banquet in Atlanta, at the SEJC’s 29th annual conventioin. 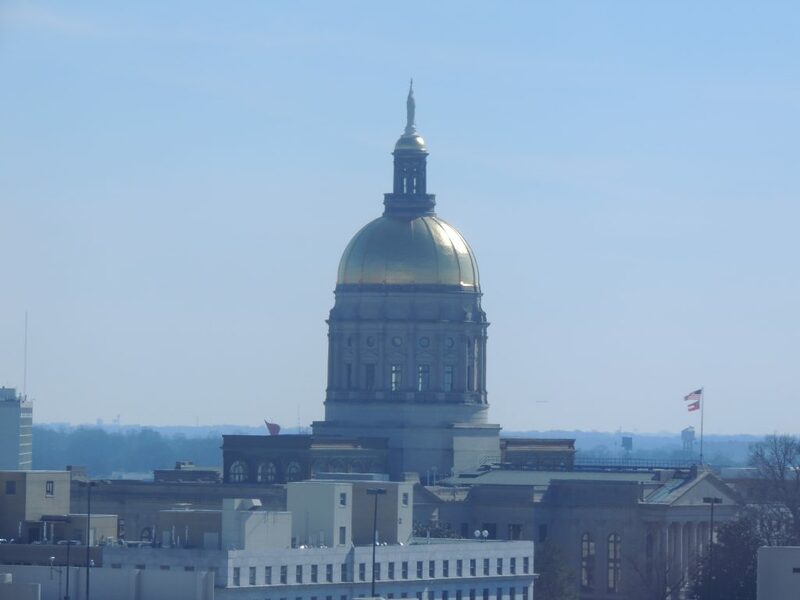 View of the gold-domed Georgia State Capitol from the conference room where the annual business meeting was held. View of the Georgia State campus in downtown Atlanta from Woodruff Park. 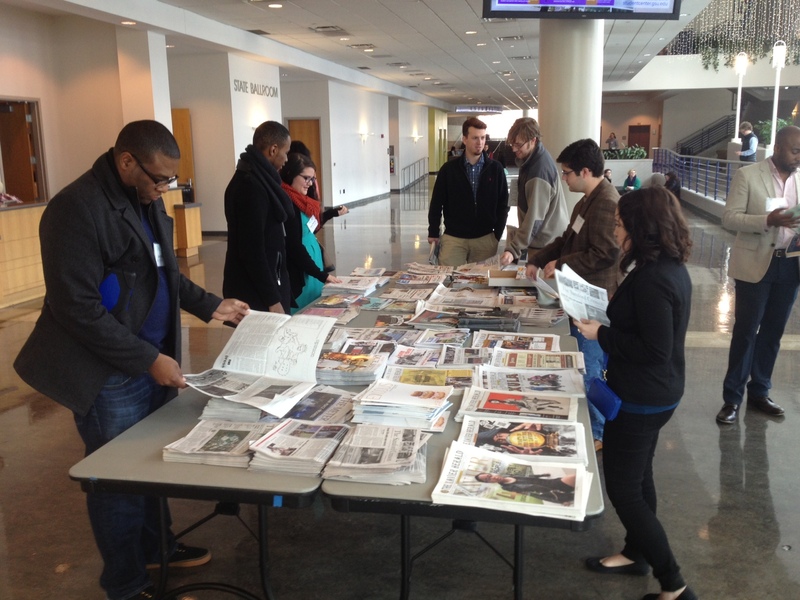 The display of student newspapers is a SEJC tradition.